Dupain’s interest in the human form grew directly from his grounding in contemporaneous thinking around vitalism and naturalism. Dupain’s father was a leading thinker in and practitioner of physical education, dietetics and biochemistry. In addition, Dupain’s interest in Norman Lindsay and D H Lawrence’s writings which were infused with ‘the importance of man’s basic instincts and emotions over the inhibiting rule of the mind’ combined in his 1930s photographs of nudes with the formal language of new objectivity. 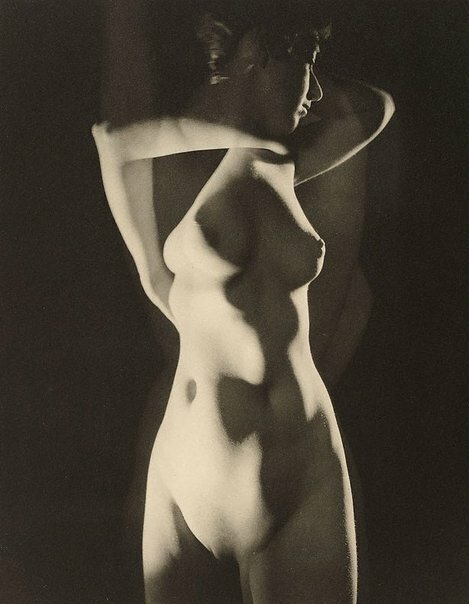 As Gael Newton has pointed out: ‘Where Lawrence and other vitalists rejected technology, Dupain brought their passionate and energetic spirit to the expression of the modern age.’1 Dupain’s interest in Man Ray around 1935 led him to carefully study the techniques of solarisation and montage. The visual influences were inevitably filtered through reproductions in books and magazines and these melded with vitalism and naturalism in Dupain’s practice. Signed and dated l.r. sheet, pencil "Max Dupain '31". Judy Annear, Photography: Art Gallery of New South Wales Collection , 'Australian modernism', pg.131-149, Sydney, 2007, 136, 138 (illus.). Judy Annear, World without end - Photography and the 20th century , 'World without end: Photography and the 20th Century', pg.8-29, Sydney, 2000, 23, 75 (illus. ).